While El Niño has blessed much of the western United States with needed wintry precipitation, at least one Pacific Northwest resort would contend that it’s not all rainbows and pillow pops. Washington’s White Pass Ski Area, the resort that gave rise to the legendary Mahre brothers of U.S. Ski Team fame, is closed indefinitely after the latest wave of storms caused landslides and mudslides, washing out the road on not one, but both sides of the mountain pass that accesses the ski area. "It's just eerie up here to have all this snow, this beautiful weather, and just a bunch of [construction] trucks running back and forth," said White Pass General Manager Kevin McCarthy in an interview with the Yakima Herald Republic. 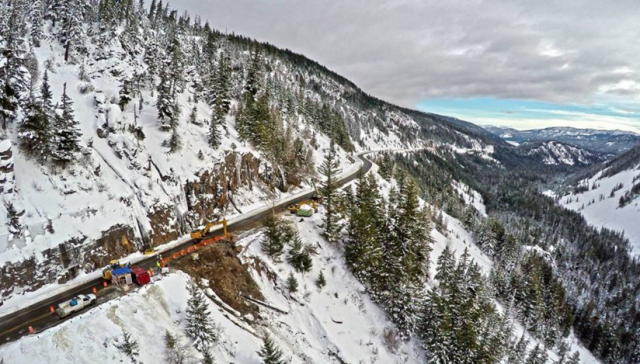 Last Wednesday, the same storm that dropped thick blankets of snow across the Cascades caused a series of rock and mudslides that washed out enough road to close a 45-mile stretch of U.S. 12, the road connecting east side Yakima to west side Olympia. The road is also the only access point for White Pass Ski Area, and with the highway closed indefinitely and the area directly within the road closure radius, White Pass can only sit and wait. "It's all Mother Nature's snow now," McCarthy continued. "When we open, we're going to open everything. Everything." In fact, White Pass reports that it has more snow than it had at any time last year—up to 55 inches at the top—making the closure that much more painful for southern Washington skiers. No one at White Pass was immediately available for comment, but a White Pass answering machine reports that Washington State Department of Transportation is working around the clock on both the east and west side washouts, though a timeline for reopening has yet to be established. Their website continues, “While this weekend looks doubtful, we’re hoping for next week!” But a report by the Yakima Herald Republic cites the WSDOT’s estimate of a potential one-lane opening no earlier than Christmas. In the meantime, many ski areas are stepping up to help displaced White Pass skiers, including the hill’s partners Mission Ridge and 49 Degrees North—who will both honor the resort’s 5-day free exchange program for pass holders despite White Pass’ closure. In addition, Schweitzer is offering free skiing for White Pass pass holders and Stevens Pass is offering free midweek tickets, giving skiers temporary relief as they dream of first tracks at the home hill.